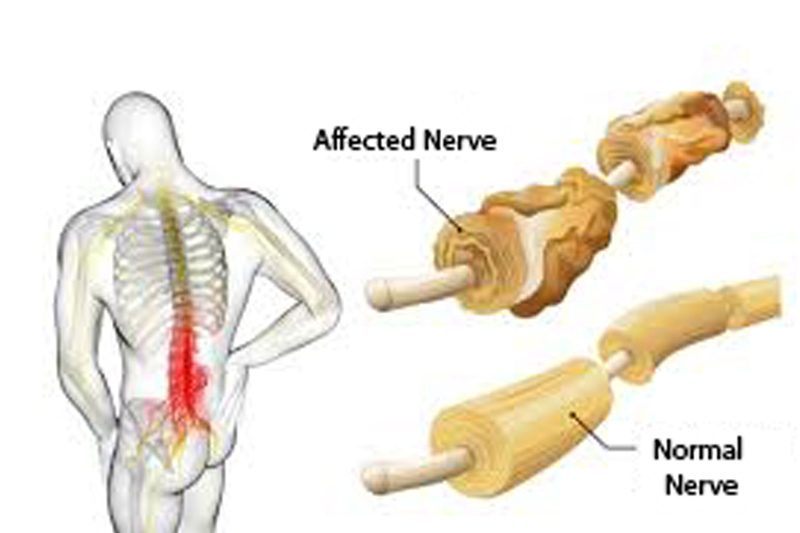 Guillain-Barré syndrome is a rare syndrome in which the nerves in your body are attacked by the body’s immune system itself. Usually the first symptoms of this condition are weakness and tingling. These sensations can spread fast and finally paralyze the whole body. In its advanced stages Guillain-Barré syndrome is considered a medical emergency. Majority of the folks affected with this condition must be hospitalized to receive proper medical care. The exact cause of Guillain-Barré syndrome has still not been discovered. More often than not, it is preceded by an infectious illness. It could be a respiratory infection or a stomach flu. Unfortunately, there is no known cure for this condition, but certainly there are treatments to ease symptoms and reduce the duration of the illness. Though complete recovery from Guillain-Barré is questionable, most people recover significantly. Weakness, numbness and fatigue are the residual effects of Guillain-Barré syndrome. It may cause numbness, tingling, and weakness. It can also cause pain. These symptoms usually start in the longest nerves in the body and so first affect the feet and later the hands leading to ascending paralysis. This is sometimes called the “stocking-glove” pattern. These may spread to your upper body and arms. In some people symptoms may begin in the arms or face. Muscle weakness may give way to paralysis as Guillain-Barré progresses. Symptoms in the form of weakness may heighten within two to four weeks after symptoms begin. Acute inflammatory demyelinating polyradiculoneuropathy (AIDP): The most prominent sign of AIDP is weakness of the muscles. It usually starts in the lower part of the body and spread upward. Miller Fisher syndrome (MFS): In this condition the paralysis starts in the eyes. The condition is also related to unsteady gait. About 5% of people with Guillain-Barre syndrome are suffering from MFS. Ironically, this condition is more prevalent in Asia. Acute motor axonal neuropathy (AMAN) and acute motor-sensory axonal neuropathy (AMSAN): This subtype of Guillain-Barre is not that common compared to other two, but this is more frequent in China, Japan and Mexico. If the tingling in your toe or fingers seems to be spreading or getting worse, you can fix up an appointment with your general practitioner to rule out the condition. Seek immediate medical attention if you have any of these below-mentioned signs or symptoms. Guillain-Barre syndrome should not be taken lightly as it is a serious condition that can worsen fairly quickly. The sooner appropriate treatment is started, the better the chance of a good outcome. Though the exact cause of Guillain-Barre syndrome is not known, this condition usually occurs days or weeks after a respiratory or digestive tract infection. Rarely, recent surgery or immunization can give rise to Guillain-Barre syndrome. Of late, some cases have been reported following infection with the Zika virus. Our immune system usually fights against only invading organisms, but in Guillain-Barre syndrome our immune system will start attacking our nerves. In Acute inflammatory demyelinating polyradiculoneuropathy (AIDP), the most common subtype of this condition, the nerves’ protective covering (myelin sheath) is damaged. Due to this, nerves won’t be able to transmit signals to the brain, leading to numbness weakness or paralysis. Guillain-Barre syndrome affects people across age groups, but you are at slightly greater risk if you are a man or a young adult. The following are the triggers of this disorder. In its advanced stages, Guillain-Barre syndrome increases the complications of long-term health issues. Though not common, this condition may even lead to death due to the complications such as respiratory distress syndrome and heart attack. About 3% of the folks may even have a relapse at some point in their life. Previous PostPrevious On Our 7th Anniversary..